Fine Arts Center Blog: NEW ACQUISITION: Robert Cottingham, "The Spot"
NEW ACQUISITION: Robert Cottingham, "The Spot"
His work is most often associated now with his 1960s and ‘70s realist contemporaries such as painters Richard Estes and Chuck Close, and sculptor Duane Hanson. Accordingly, Cottingham was granted a major retrospective at the Smithsonian Museum of American art in 1998. During his travels, Cottingham photographs advertising signs and translates them, as whole signs or as individual letters, into painting and lithographs. 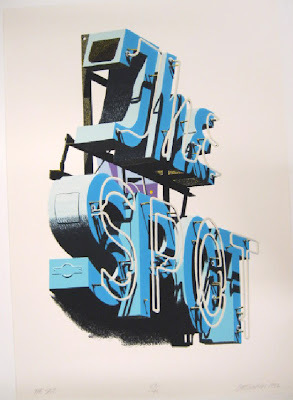 In lithographs such as The Spot, the artist seeks to preserve the unique appearance of mid-20th century signage, much of which has now disappeared, that defined thriving downtowns across the nation. The Spot is currently on view in the first-floor galleries.